Cosplate is a new thermoplastic engineered to provide strength and form without compromising comfort and flexibility. Like other thermoplastics, it can be heated and shaped to fit your needs and cut with scissors. Once cooled to room temperature, it locks in the desired shape. What separates Cosplate is its ability to maintain shape and durability and provide structure while remaining flexible. It is soft and comfortable on the skin, It has a smooth surface that can be easily textured while hot and can also be painted. It loves LEDs and can be vacuum formed. It can be sanded and even welded together with a bit of heat. Cosplate is a perfect addition to your next project. Select Size Small 12" by 24"Medium 20" by 24"Large 20" by 48"X-Large 31.5" by 48"
What can I do with Cosplate? Cosplate just loves LEDs. The material is also slightly fluorescent so so it glows under black lighting. It soaks up regular LED light and glows wonderfully. Flames and other effects can be created by applying transparent acrylics or other paints to the surface then lighting it from beneath. If a pattern is painted onto the underside of the material then light can be used to reveal it. Because it is sandable, you can also lightly sand the bottom surface to aid in diffusion. Cosplate fuses with itself with enough heat. Gentle application of localized heat will create an almost seamless repair. Be careful to not heat too large an area or it will get soft and deform slightly. Cosplate sands well by hand or with a dremel, and the edges can be heat sealed again to smooth it out. If you want a to return it to a clear and perfectly smooth finish then more localized heat is needed. A soldering iron can be used, but a blade with a flat edge, like a hot knife or wood burner, is ideal. Cosplate can be seamed with a bit of heat at the joints. As before, a soldering iron works, but a flat bladed heat source like a hot knife or wood burner will work better. A flat blade will allow more control and evenly distributed heat, making the joint cleaner. Heating the joint, then welds the material together. Once it cools, the joint is as strong and flexible as the rest of the material. It can then be shaped and cleaned up for a smooth finish. Using a lifecast, we were able to mold a mask directly onto a model’s face, following the contours perfectly. It is a lot safer and easier to use a life cast or other mold as the material is hot and can cause injuries if shaped directly on the skin. We took advantage of Costplate’s transparency to transfer lines from the mold to the material then cut the desired shape with scissors. After removing the eyes and sanding smooth the piece was heated gently to even out the sanded surface. Care must be taken to not overheat the material or the shape may change. After application of an adhesion promoter, we airbrushed black acrylic paint onto both sides for a durable and smooth finish. The mask can be directly applied to skin with prozaid or spirit gum. 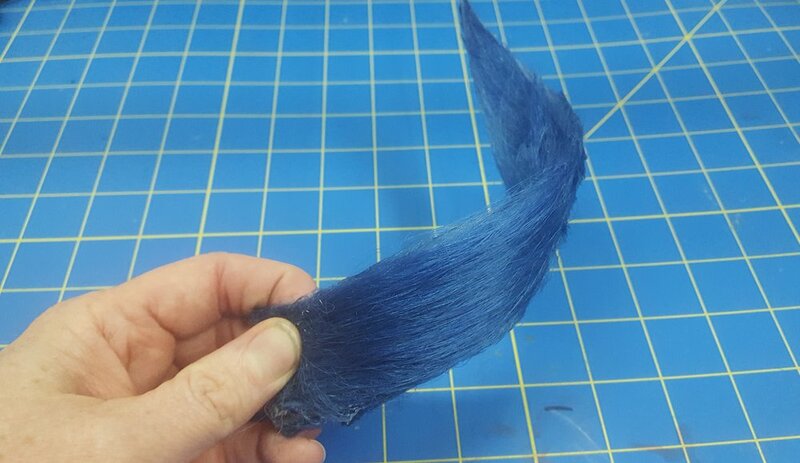 We don’t have a lot of experience styling wigs but with some spray glue and a bit of luck we were able to make a piece that bounces and holds its shape well. LEDs could also be included to create glowing effects as well. Lots of possibilities and we will for sure be digging into this in the future. Cosplate can be attached to fabric using Super 80 spray glue. It holds the fabric well. We tested a stretchy material but a non stretch should also work well. The edges can fray if cut, so it’s necessary to roll the fabric over the edge and glue down. Other glue options may be easier to apply but have not been tested. Cosplate LOVES textures. It also likes to steal your fingerprints. Once the surface is heated it will soften and textures can be transferred with pressure. Once it cools down the texture is permanently transferred. It could be heated and modified multiple times, and as long as its under 115F the texture will last. With a bit more heat, Cosplate can take even deeper impressions to transfer deeper textures or details. It can also be stamped for various effects. Organic textures can be used to catch the light from LEDs or you can imprint a regular pattern for superhero armor and other textured armor. While Cosplate can be shaped and formed by hand but with a simple vacuum table it’s possible to do some interesting things. What Glues work with cosplate? We have had success with barge contact cement and high temp hot glue. Cosplate is safe for extended use on skin, but care must be taken when sanding and heating it. A dust mask should be used when sanding to prevent inhalation of particles. If you are heating the material to a high temp for welding, vac forming, or sculpting, then a well-ventilated room is recommended as well as a respirator. Gloves are also recommended for higher temperatures. Do not place hot material on exposed skin as it can be difficult to remove and may cause burns. Will it melt in the car or outside? Cosplate will retain its shape to around 115F. However, Care must be taken when storing the material in a car or other location that might see high temperatures, as may lose its shape and ruin the piece.